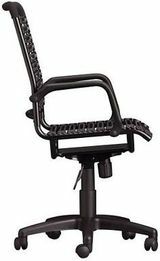 Bungee-style cords, a gas lift, rolling casters and a swivel spin make this executive chair worth the ride to the top. Strong elastic black cords give firm, cushioned support and lessen fatigue. Black-on-black cords, powder–coated steel frame, casters and neoprene detailing mean business. 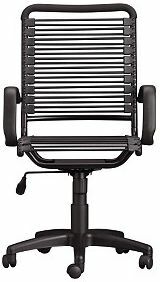 23"W x17"D x 35-39"H (17.5-20.75"H seat). Prefer something with a little more designer panache? 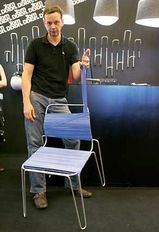 British designer Tom Dixon will be happy to sell you you his Rubber Band Chair (below) for $195. Note, though, that Tom's chair is a one–trick–pony: you sit in it and that's that. No swiveling, rolling around, rocking or falling over backward and making a fool of yourself.